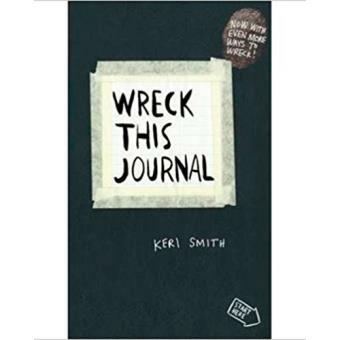 This is a new edition of Keri Smith's bestseller, with updated material Think of Wreck. This Journal as the anarchist's Artist's Way - the book for those who've always wanted to draw outside the lines but were afraid to do it. For anyone who's ever wished to, but had trouble starting, keeping, or finishing a journal or sketchbook comes Wreck This Journal, an illustrated book featuring a subversive collection of suggestions, asking readers to muster up their best mistake - and mess-making abilities to fill the pages of the book (and destroy them). Through a series of creatively and quirkily illustrated prompts, acclaimed artist Keri Smith encourages journalers to engage in "destructive" acts - poking holes through pages, adding photos and defacing them, painting with coffee, colouring outside the lines, and more - in order to experience the true creative process. With Keri Smith's unique sensibility, readers are introduced to a new way of art and journal making, discovering novel ways to escape the fear of the blank page and fully engage in the creative process. Bestselling author Keri Smith is a freelance illustrator by trade, and has illustrated for the Washington Post, The New York Times, Ford Motor Company, People, The Body Shop and Hallmark. She is the author of Wreck This Journal, How To Be An Explorer of the World and Mess. A native of Canada, she lives in the US.